This is a 365 project that is meant to reflect life and more specifically mine. So although this photo is by no means a masterpiece in a photo sense, it is a masterpiece in my life, simply because of the content. 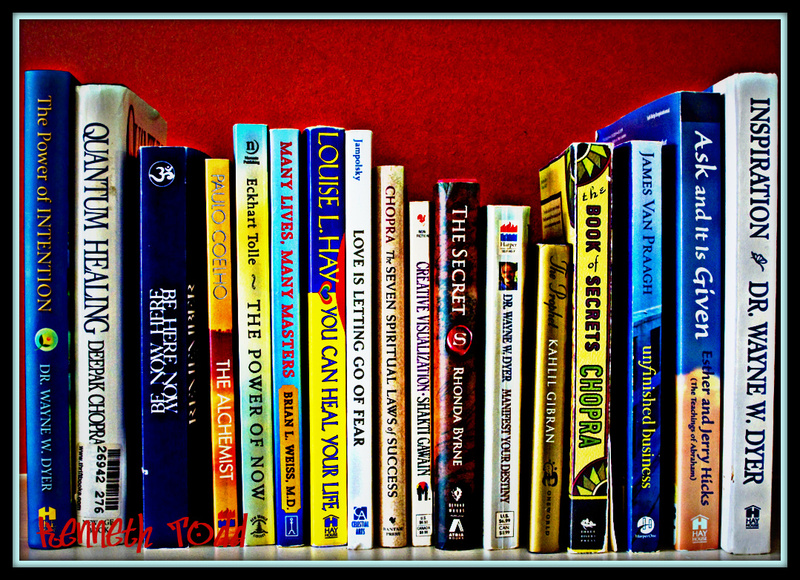 This is a slice of my library and so much knowledge, wisdom and inspiration come from these books. I think you are searching for something. Aren’t all of us!! It’s books like these that help us remember who we really are. And your photo inspired me to dust some of mine off and re-read them. Thanks! Almost looks like my bookcase, mine are little more business oriented though. A great selection of books! They truly are inspiring reads. Ah…We have many books of wisdom in common, my friend. I’m enjoying your blog. Love it! I did this at the start of my blog adventure – makes you look again at the things you possess! Great! Great share!We have similar tastes.Will check out a few of the ones I haven’t had the pleasure of reading.Thanks. Love this one. Great stength of focus and pretty natural too. I love this. It inspires me to pick a section of my shelf and take a picture. I read many of these books, Wayne Dyer is my favorite author you have represented here. ah we have books in common! I have all of these books! How awesome… a kindred friend!